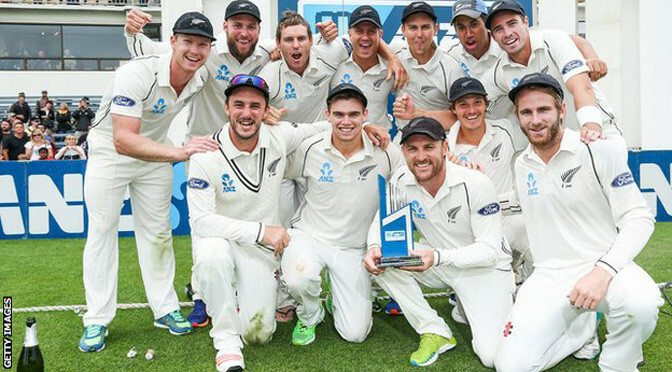 New Zealand completed a fine comeback to beat Sri Lanka by 193 runs and win the two-Test series 2-0. Kane Williamson and BJ Watling’s Test record sixth-wicket partnership on day four hauled the Kiwis back into the match, having trailed by 135 on first innings in Wellington. Mark Craig took 4-53 as the hosts bowled out Sri Lanka for 196. “The last little while we’ve played some outstanding cricket,” said New Zealand captain Brendon McCullum. New Zealand have not lost a Test series since being beaten in England in May 2013. Since then, the Kiwis have won in West Indies and India, beaten West Indies away and drawn against Bangladesh and Pakistan. Resuming on 45-1 in pursuit of an improbable 390 for victory, Sri Lanka slipped to 110-5 by lunch, and New Zealand wrapped up victory with a session to spare. The sides start a seven-match one-day series on 11 January in Christchurch.